Many of the people Gladstone meets are trying to find low-tech ways to replace what they loved about the internet. Girls in bars try to present themselves as they do in their Facebook profiles (posing in ways that emphasize their best features), Craigslist users tack notices on community bulletin boards, Ask Jeeves sets up shop in Central Park, and people try to get cats to entertain them. So far it all sounds like a funny bit of social satire, but if that were all there was to Notes from the Internet Apocalypse, it’d be rather shallow. Fortunately there’s something else going on. Early in the story we learn that Gladstone’s marriage has failed and he’s unhappy about this. As the story progresses, we gradually pick up a few clues about what happened and we see that though he doesn’t seem conscious of it, more than anything Gladstone is trying to deal with his loss. During this process he forces us to consider our relationship with the internet. What are we using it for and how is it affecting us? Is it a place to get work done? Meet new people? Change our self-image? Feel close to other people? Avoid being alone? Escape from our real-life commitments and relationships? These are questions for all of us and I found myself thinking about this after I’d finished the book. 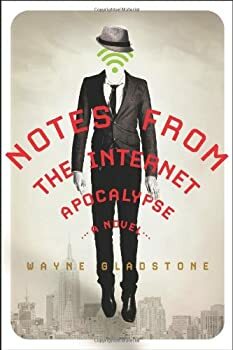 I listened to the audio version of Notes from the Internet Apocalypse which was narrated by Paul Michael Garcia and produced by Blackstone Audio. Garcia’s voice and conversational style are perfect for this book. It’s 5 ½ hours long. You can listen to a sample at the Amazon page and you can read the first chapter here.